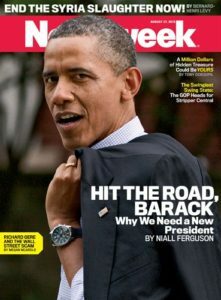 Newsweek announced today that after nearly 80 years, it will cease publishing the magazine in print and go all digital in 2013. They are basically throwing in the towel on the disastrous merger of Newsweek and The Daily Beast. At the same time, our business has been increasingly affected by the challenging print advertising environment, while Newsweek’s online and e-reader content has built a rapidly growing audience through the Apple, Kindle, Zinio and Nook stores as well on The Daily Beast. Tablet-use has grown rapidly among our readers and with it the opportunity to sustain editorial excellence through swift, easy digital distribution – a superb global platform for our award-winning journalism. By year’s end, tablet users in the United States alone are expected to exceed 70 million, up from 13 million just two years ago. The announcement isn’t a big shock. Bloomberg estimated that Newsweek would lose $22 million this year amid a continued advertising slump and readers choosing digital over print in larger numbers. In July, majority owner Barry Diller sent shivers through the magazine when it was reported that he said that Newsweek was going digital in September. That forced Brown to issue a memo to calm Newsweek staffers. Barry Diller would like to make it clear that he did not say on the earnings call as reported that Newsweek is going digital in September. He made the uncontroversial, industry-wide observation that print is moving in the direction of digital. Below, in summary, are the points he actually made on the IAC earnings call when he was reporting the tremendous results of the company this quarter. 1/The Newsweek brand is strong, and far stronger than it has been in years. 4/In September we would be evolving our plan for the year ’13, with many options to choose from. I am enroute to Jane Harman’s event in Aspen and I am sorry that I am not able to reassure you in person but I will be back in the office on Monday. Please refer any queries to Stephen. While shuttering the print edition of Newsweek will save the company money in overhead and printing and distribution costs, it remains to be seen whether or not that will be enough to offset the loss of print ad revenue and make the new all-digital magazine profitable.